Although this prominent behemoth incurred the wrath of many Upper East Siders for its great height and windy plaza, it is one of the city's finest post-War II high-rise apartment towers. While its soaring height looms over Madison Avenue, the tower itself is setback both from the avenue and the sidestreets. 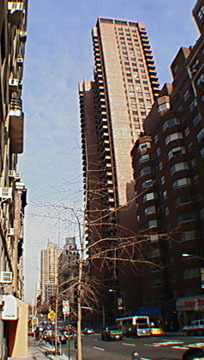 The surrounding plazas, all paved in large bricks similar to those on the tower, permitted the tower to rise as tall as it did under the then applicable zoning. The tower's main redeeming feature is, in fact, its brickwork, a very large, reddish brown "iron-spot" brick whose warm color harmonizes well with its surroundings. The design, by Thomas Lehrecke of Oppenheimer, Brady & Lehrecke, and Philip Birnbaum, is distinguished by its full-walled balconies and the modulation of its facades. This is the finest project of the developer, Rose Associates. The tower's plazas, which have pyramidal planters, often suffer from windy gusts as a result of the tower's exposed height. 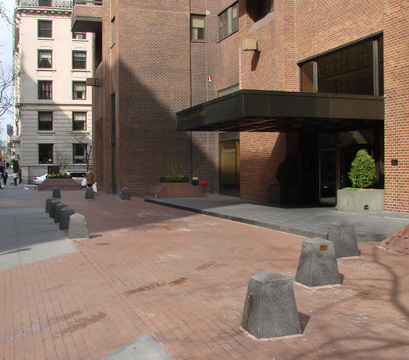 This sentinel, which has a large driveway on Madison Avenue, was an important pioneer in new development north of 86th Street at the time and was important in upgrading its Carnegie Hill neighborhood by giving it a highly visible new landmark. While it can be argued that it broke the scale of the area, so did the Carlyle Hotel and the great multi-towered apartment buildings of Central Park West. In fact, this tower helped mitigate the terrible aesthetic damage inflicted on the Upper East Side by the giant Mt. Sinai Hospital tower, designed by Skidmore, Owings & Merrill about a dozen blocks to the north. While the tower is not a masterpiece, it is not bland but very rigorous in its massing. The building has a rooftop health club and a garage, and the 248 cooperative apartments, all two- and three-bedroom units, have 9-foot-high ceilings, which was higher than the standard then current. A standout, yes, but a handsome one. One critic has likened, in a derogatory fashion, its street-level appearance to a fortress, yet the analogy is not entirely inappropriate as a few blocks to the north on the avenue stands the ruins of the Squadron A Armory, a similarly colored battlement. This building is just to the west of the very handsome Roman Catholic Church of St. Thomas More at 59-63 East 89th Street that dates to 1870 and was designed by Hubert & Pirsson. That church is across 89th Street from another major apartment tower at 50 East 89th Street, a dark brown-brick, mid-block building designed by Emery Roth & Sons that has several maisonettes and a large plaza on East 88th Street that abuts the walled garden of 1088 Park Avenue.